For the past five years Martin has toured the world with his own band to play the “classic” music from the Jethro Tull catalogue, and also many new tracks written by Martin from his albums AWAY WITH WORDS and ORDER OF PLAY, plus his latest album, BACK TO STEEL. 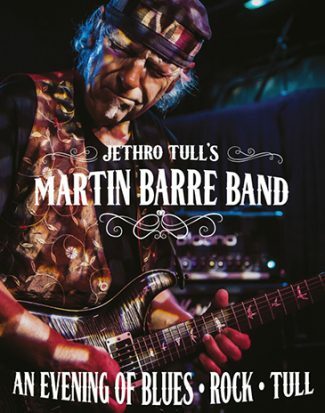 For 43 years Martin Barre was the renowned guitarist of Jethro Tull, and his role in the band cannot be overestimated. Bruce Eder wrote on allmusic.com, “His playing has provided much of the energy that allows the band to soar on record and in concert.” His unique sound and style contributed enormously to their success, which includes several chart topping albums, eleven gold and five platinum albums, a Grammy Award for CREST OF A KNAVE in 1988, and album sales exceeding 60 million units. Tull continues to be played worldwide, representing an important part of classic rock history. Martin’s guitar playing has earned him respect and recognition; he’s been voted among the best ever in the USA and in the UK for his playing on “Aqualung.” Beyond numerous Jethro Tull albums, Martin has plied those award-winning chops with many other distinguished artists, including Paul McCartney, Phil Collins, Gary Moore, Joe Bonamassa and Chris Thompson. He has shared a stage with such legends as Jimi Hendrix, Fleetwood Mac, Pink Floyd and Led Zeppelin. Redoubtable drummer George Lindsay, alongside super songwriter and bass player Alan Thomson form the core of Martin’s accomplished band, with vocals performed by the talented and distinctive Dan Crisp. All members are committed to giving the Tull fans and a broader audience the chance to hear tracks not performed for many years with a few surprises along the way.